Tuesday was a special sewing day for Aussie Hero Quilts. Jan-Maree, the gem who organises Aussie Heroes invites all & sundry to her home fairly regularly for a concentrated sew-in. This time I had the day free, and drove down to Sydney to join in. This week there were 6 of us, and we got quite a bit done. Two ladies came from Western Australia! Now I thought I had a long way to go! (tee hee hee). For those not in the know, WA is clear across the other side of the continent - as far as Los Angeles to New York. We do various things. 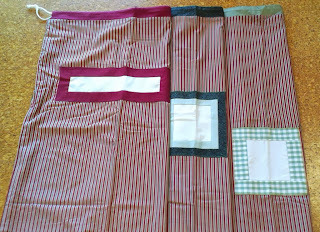 JM is happy for people to simply send in a quilt top, which then needs to be quilted. So one of the jobs to be done on these sewing days is to marry quilt backings to quilts which are then sent off to be quilted. This is not as easy to do as it sounds, as you need to cut the backings, then add strips to the backings to make them fit. We usually add in a "GT stripe", i.e. cut a 6" strip down one entire long side, and insert a strip of a co-ordinating colour. Think we got 10 of those done. Two of us cut an entire roll of Matilda's Own cotton wadding into quilt sized lengths. These got added to the tops & backing above, for the quilters to use. There's also those mundane jobs like ironing. Boo hiss! I do enough of that at home. 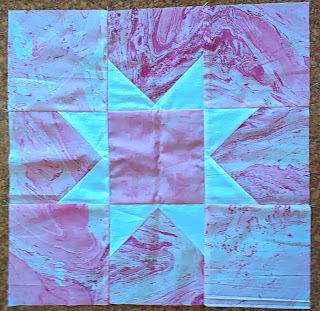 Another thing Jan-Maree organises is the Block of the Month, with tutorials appearing on the first day of the month on the AHQ blog. 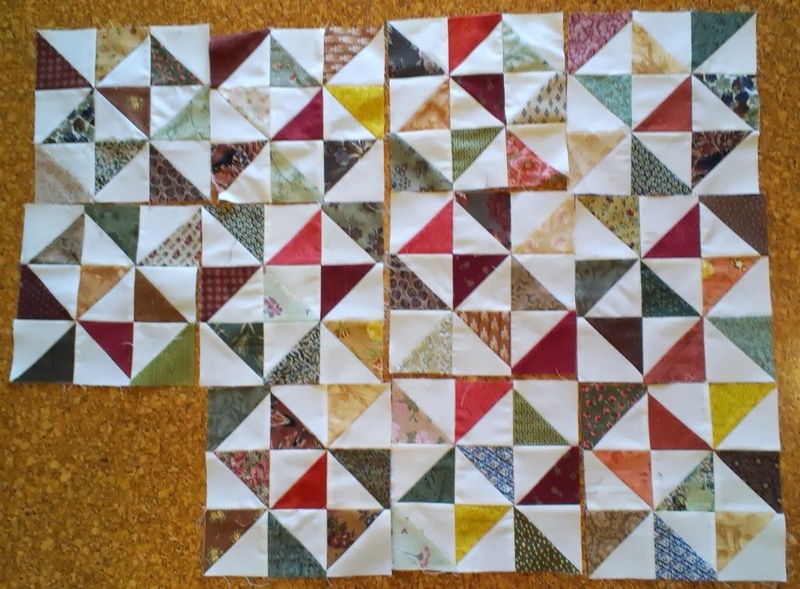 These are generally fairly simple blocks which finish at roughly 10" square, so you don't need much experience, or many blocks to get a quilt done. The blocks are either made up by the person making them into a quilt or they get sent back to . Those that have been sent to Jan-Maree get sorted into kits with sufficient blocks to make up a quilt, and then these get put together, often in a sewing day. Sometimes the BOM kits contain blocks from different months. 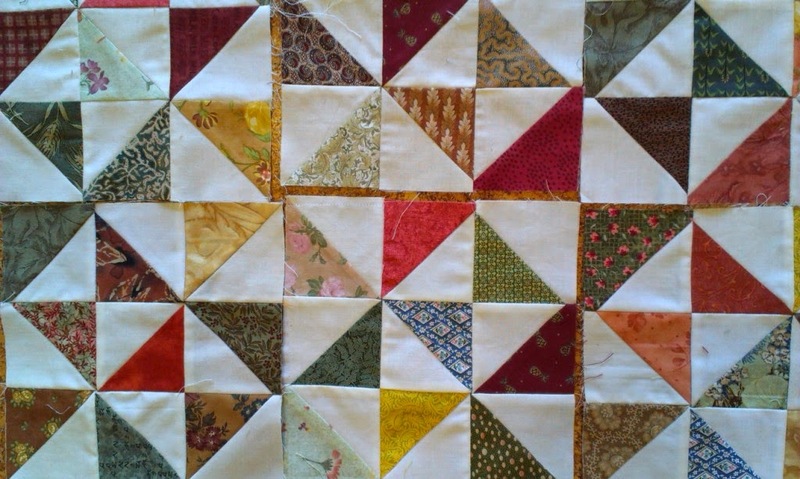 This often means that some blocks need to be trimmed down to match the others. We got 3 quilt tops made this time. 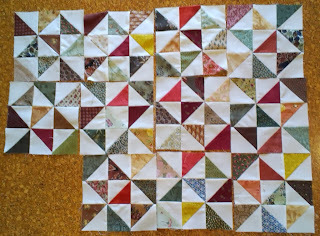 My job on Tuesday was to put together a BOM quilt with Courthouse Steps blocks which was the BOM for May this year. The tutorial for that is here. The kit was two blocks short, so despite there only being 15 blocks in total, I had to make up two before I started to sew them together. 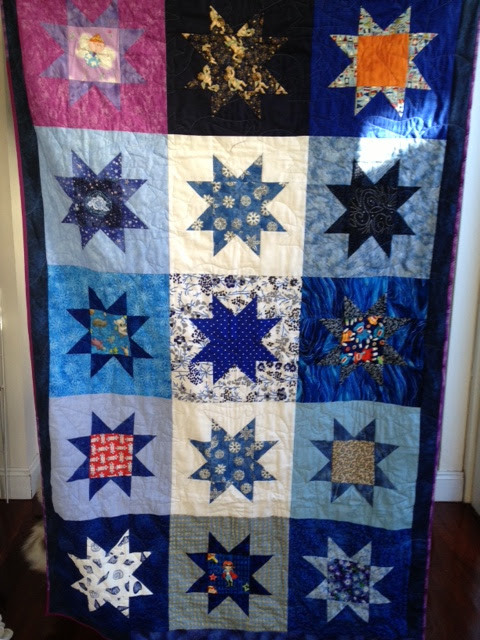 The quilt is likely to be a Wounded Warrior quilt, and here is how it ended up. The two blocks I made are in the middle row each side of the centre block. I was really pleased with them - they really fitted into the whole scheme of things, and you wouldn't know that at least 3, and possibly as many as 5 people made the blocks for that top. Back a while ago I told you all about a quilt made by AHQ Facebook followers organised by Jan-Maree which was going to a lady in Afghanistan. The blocks were made to the April BOM instructions, and the brief was blue & white stars. Well the quilt arrived in Afghanistan, and the lovely lady who received it sent a gorgeous "thank you" to JM and included a photo of the quilt. My two blocks are the two in the centre column, with the white background. Doesn't the quilt look great? Its a good feeling to see the thank you's and to know that your work is appreciated by the recipient. Til next time.... Keep on stitching. Not a lot of sewing, that for sure! Its been school holidays for the last two weeks and we have had some quality time with the kids, so my sewing has been a bit backstage so to speak. I have had to work on bits and pieces whenever I've had a spare half hour or so. 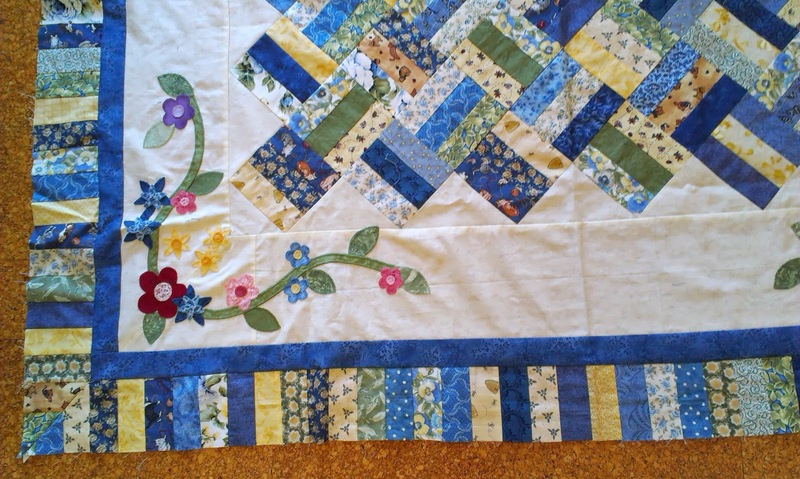 So firstly, I completed a lap quilt top for Stitching Hearts. 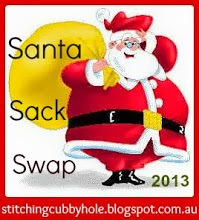 It is going down to Cabarita tomorrow to be paired up with a backing and to be pinned ready for quilting. 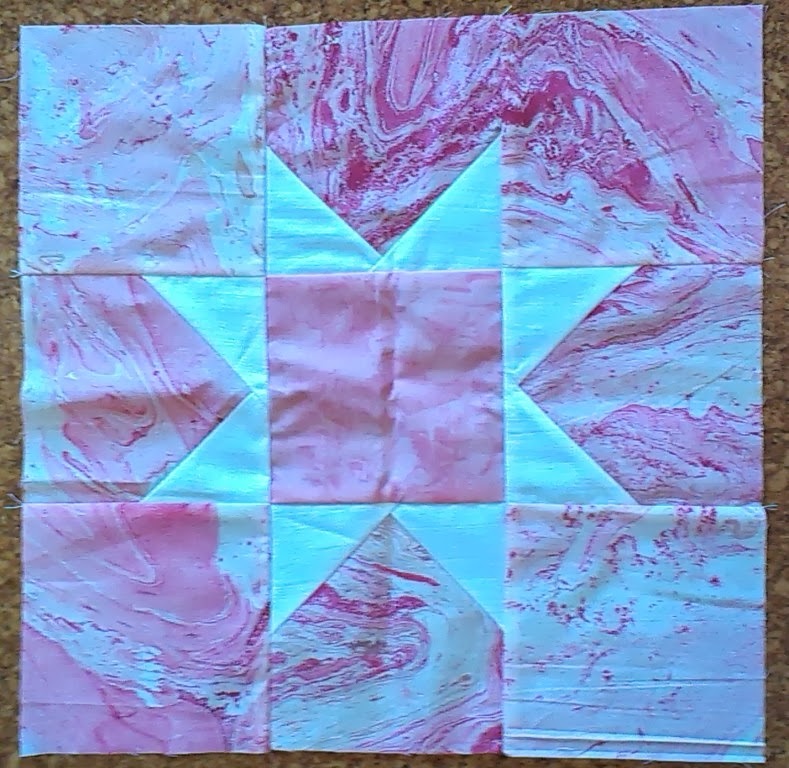 I love this pattern, its so easy to do and looks great. 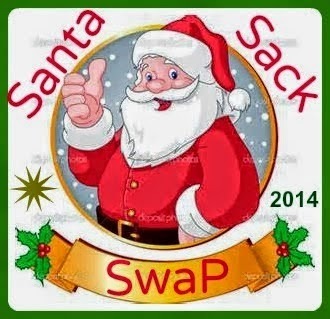 It has been cut out for ages and lurking in the shadows, so I decided to just get it done. Next cab off the block were three laundry bags for Aussie Heroes. 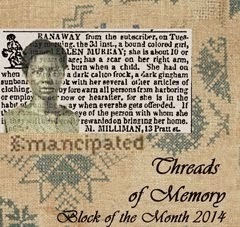 The fabric was gifted to me by my lovely friend Joyce for the purpose. As I was making three from the one piece of fabric, I have made them slightly different, with the name patch and the cord channel different in each bag. They were cut out and ready to sew for ages too. Its the cutting out and planning which takes the time I find. 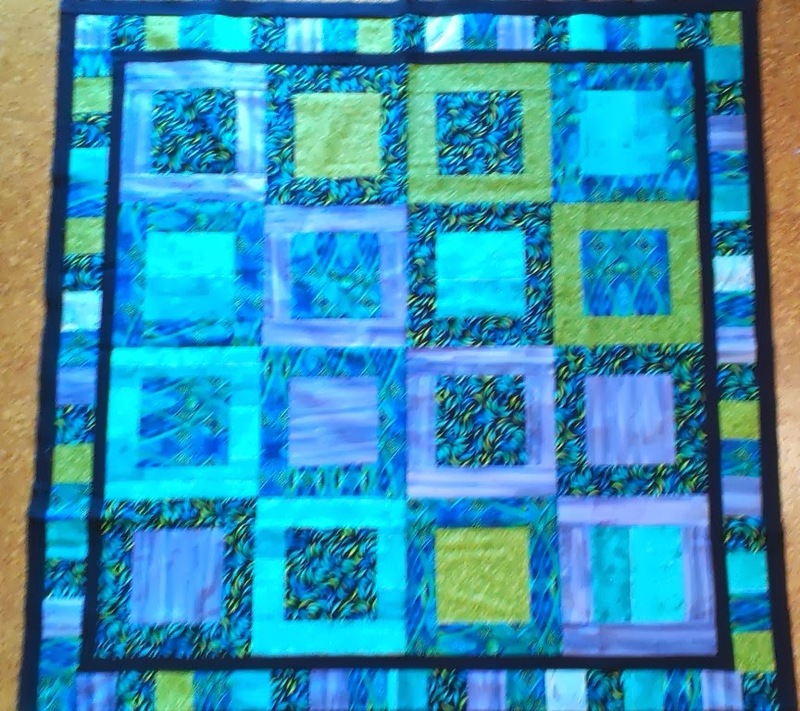 A week or so ago, Jan-Maree from Aussie Heroes, put out a request for a collaborative quilt on Facebook, and asked that FB friends each made one square to be put together for a special recipient. We did a couple of those a month or two back. I have put up some Photos about that here. At Friday Quilters last week, I managed to progress my leader & ender Broken Dishes blocks a bit. I now have 11 of those complete and the 12th is all pinned & ready to sew. Must say that when I saw the block initially, I couldn't see why it was called Broken Dishes, but now that I have some of the blocks sewn, I can see the pattern when they are placed together. I don't really care - its a great way to use all those precut triangles some lovely person donated to us. I am really loving the colours and the way the block is turning out. The blocks will be sashed after I have completed making them. I have also managed to add a couple of borders to Verna's Garden. I have chosen to do a piano key border framed with a blue tone on tone fabric. There is still one side of the piano key border to do. I am thrilled with how it is turning out. 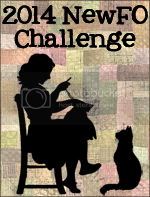 I went down to visit with her on Saturday last, and had so hoped to have that quilt finished so that I could present it to her, but that was not to be. I am still a long way off completing it. Hopefully next time I blog about it, I will have the top done. I have spent the morning out in the garden today. After a lot of cold, wet weather lately, the sun is out today and it is a glorious mid-winter day with beautiful sunshine, and far too nice to spend indoors. I have had a short sleeved t-shirt on, and so enjoyed pottering around with birds singing and the bees buzzing! Living in an area with lots of trees around means that sometimes the birds are quite deafening. I'm not complaining! So now its time to go hit that machine. I have a quilt in the Bernina 440 which I am quilting for Stitching Hearts at the moment. It was made by Jan and is very pretty. More about that another time. Or perhaps I could find something else to sew??? It has been an industrious couple of days. After almost 2 weeks of wet weather, when the rain has at times been literally bucketing down, we have had a couple of gorgeous sunny days. It certainly makes for a more positive attitude! So to start with, I have made a batch of marmalade, and 18 bottles of various sizes are sitting quietly waiting for me to print of labels for them. This time I used a bunch of citrus fruit kindly given to me some time ago. I chopped up all the fruit when it was given to me and had it in the freezer, so out it came on Monday. It's a five fruit marmalade - tangelos, grapefruit, mandarins, oranges & lemons. Haven't made that mix before, but it seems OK. I will have to let the Marmalade Aficionado, a.k.a. David, do a taste test to pronounce it fit for human consumption. In the mean time, I have been trialling different threads for quilting. Back a couple of weeks ago I bought a whole selection of different threads at the Darling Harbour Quilt Show. The first of the trials was on a Stitching Hearts quilt made by Ellen recently. For this one, I used Wonderfil Tutti in a variegated pink, which I think is called Hibiscus. The Tutti is a 50wt - 3 ply Egyptian Cotton, double gassed & mercerized. The recommendation was for a 14/90 top stitch needle. I started off by stabilising the blocks in the ditch with regular thread and then swapped to the Woderfil for the blocks and sashing. As you can see, there is still a bit of binding to sew down on the left side. I should get that finished tonight to take with me to Cabarita tomorrow. On the blocks I used a commercial quilting template with 4 tulips which I have had for many years and never used before. Quite like this pattern and I'm glad I used it. For the sashing I made a template from a pattern by Keryn Emmerson. 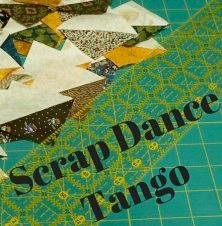 She seems to only do pantographs these days, but way back in 1995 she produced a couple of packs of patterns titled "2 Easy" . I have the "30 simple borders" and another for blocks. They are great designs. Thank you Keryn. The one I used here she calls leaf and scroll, and was quite easy to do. Well, the bottom line is that I didn't enjoy using this thread. I have a Bernina 440QE and prior to that I had the 150QE. I don't think that Berninas enjoy "fancy" threads. I really tried to do the right thing and oiled the machine before I started and put in the right needle for the job. But the thread shredded, and where I used small stitches at the start & end of each section it bunched up too much leaving rather an ugly lump. I probably needed to take the thickness of the thread into consideration and not do those tiny stitches. Guess its the operator not the tool, but I don't think I will rush out to use this again. I used it to quilt a baby quilt for a lady from Church. 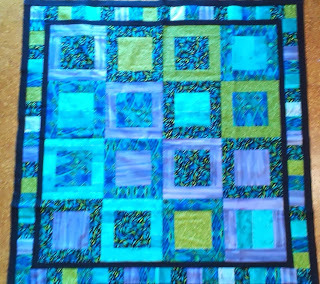 The craft group at Church made the quilt and asked if I would quilt it. The baby is a girl so predominantly pink. 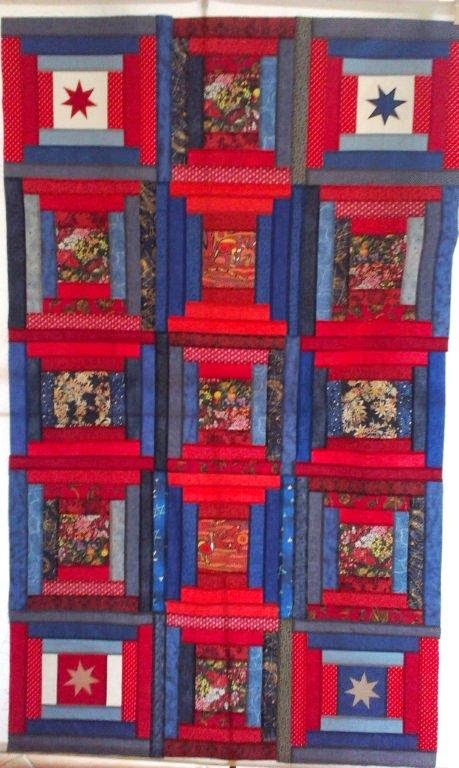 It is made of nine patches set side by side with occasional embroidered blocks. The centre blocks of some of the nine patches are appliqued with numbers from 0 through 9. It is cute. I did an edge to edge meander with a few stars and hearts thrown in. The embroidered blocks I echo quilted, and for the fish I did some tiny bubbles. And the chimneys on this house got some spiralling smoke. I loved using the Isacord! It just glided through my machine and produced a lovely effect. I will certainly be buying some of that! I still have about 4 different thread to trial, and I want to buy in some Aurofil. Gemma at Pretty Bobbins swears by it, and uses is to hand quilt as well, so I am keen to try that out. What is your favourite thread to quilt with?